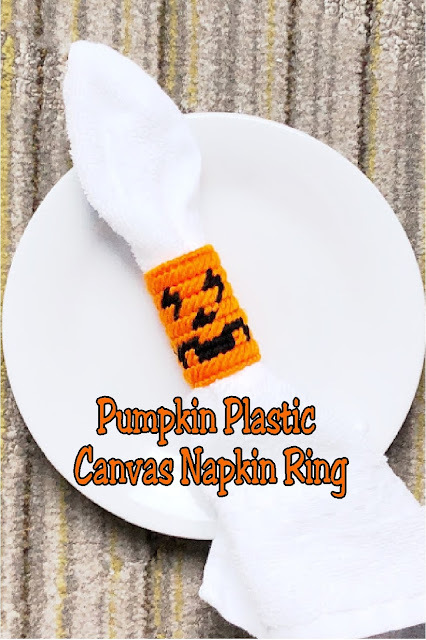 With a short Netflix binge night, you can sew up a whole set of these plastic canvas napkin rings perfect for your Halloween dinner table. These pumpkin face napkin rings are perfect to use at your Halloween party year after year. One of the easiest ways to dress up your dinner table is to add some fun napkin rings and fancy napkins to your place settings. Even if everything else is the same as you normally set the table, there will be a more formal affair to the table. This is great when you want little ones to practice manners or to spice up your family dinner. It's also a great way to decorate your holiday table. While there are a lot of printable napkin holders out there, I have a problem keeping them nice to be able to reuse later. And I hate to reprint things and waste more ink and paper. 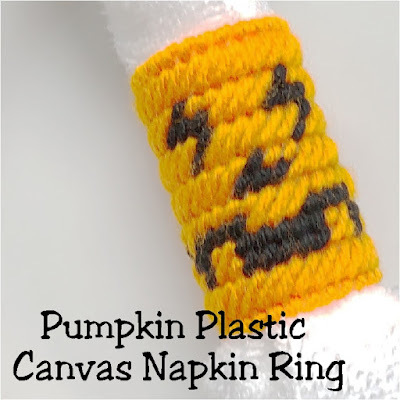 So instead I designed up some fun Halloween pumpkin face napkin rings out of plastic canavas. Plastic canvas is a simple and easy medium to use and I love to decorate with it since you can make items that are useful and fun. So I have lots of free plastic canvas party decorations here. If you know the basic stitches of plastic canvas, this pattern is super simple and quick to stitch up. It takes a 15x28 square rectange base made from 7 count plastic canvas. 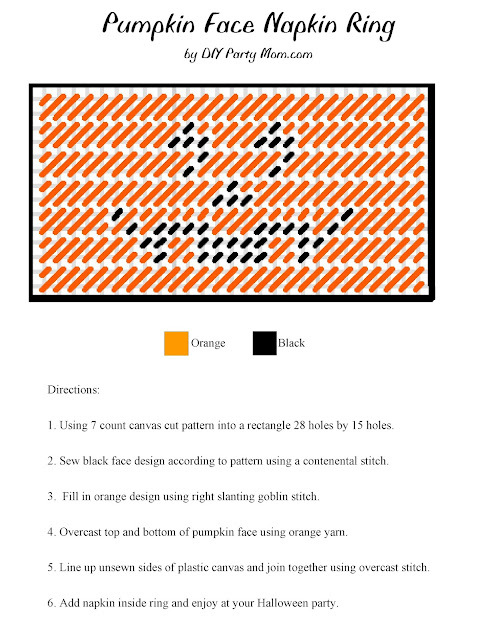 And uses orange and black yarn to stitch up, overcast, and join. It only takes a short Netflix binge to sew up a whole set of these for your Halloween party. And if you love them as much as I do, this is the sample napkin ring from a whole set that I have for holidays throughout the year. Be sure to check it out in my Party Shop here. Simple right click on this Jpg graphic for the easy directions. Then if you sew a few up for your dinner table, be sure to snap a picture and tag me @diypartymom on your favorite social media! I can't wait to see it. I could see this being a good craft for getting other family members involved. This is so cute! Thanks for sharing it with SYC.